On the first page of The Hero's Guide to Saving Your Kingdom, there's the following lines: "Some of you may not even realize that there's more than one Prince Charming. And that none of them are actually named Charming. No one is. Charming isn't a name. It's an adjective." How can you not love a book that starts out like that? The book gets better and better from that point. It's the best kind of kid's book. It has layers of plot and humor. Young kids will laugh at the physical comedy, adults will chortle at the subtle play on words, and all will guffaw parody of classic fairy tales. The Hero's Guide to Saving Your Kingdom turns four overplayed, kinda boring fairy tales on their heads, making them feel fresh and modern. Even better, the book doesn't take itself too seriously. I had the feeling that the author was laughing alongside the reader. Princes Liam, Frederic, Duncan, and Gustav are generally a bunch of screw-ups (some more than others) who accidentally rescued their iconic princesses (or in some cases really didn't) and ended up immortalized in fairy tales. Each have distinctive personalities. Frederic is a wimp, Duncan is an eccentric airhead, Gustav is a bombastic show-off, while Liam really is a well-meaning hero. They are paired with delightfully fleshed out princesses. Frederic "saved" Ella/Cinderella, who is a brave, adventure loving girl who is bored by Frederic risk-free life. Snow White actually is in love with Duncan and almost as strange as he is, but she needs a little space. Rapunzel and Gustav are total opposites. Briar Rose/Sleeping Beauty is also the opposite of Liam - in her case, she's the spoiled, evil princess and Liam is the wonderful, dashing prince and he wants nothing to do with her. As you'd expect in a modern fairy tale, it's the princesses who end up rescuing the princes, who are horribly lost in the forest. Well, with the exception of Briar Rose, who wants to entrap Liam in her thorns. Liam's little sister Lila is the one who joins up with the "good" princesses to save the four guys. The story goes back and forth between the princes and the princesses. The boys are bumbling around, helping each other out, arguing with each other, nearly getting the others killed - over and over again. The resourceful girls get themselves out of dangerous situations and save the boys. The Hero's Guide to Saving Your Kingdom is a delightfully fun read. Even though it's aimed at younger audiences, it has that timeless feel that will appeal to readers of all ages and likely won't feel dated in twenty years time. The plot does drag a bit at time, but the writing is so witty that I was never tempted to give up. It can be a long journey, but it's a fun one. I listened to The Hero's Guide to Saving Your Kingdom on audio and I can't recommend that reading method enough. Bronson Pinchot is the narrator. He has a wonderful deep reading voice and perfect comedic timing. I missed seeing the book's illustrations, but I think audio is the way to go with The Hero's Guide to Saving Your Kingdom It brought the book to life. 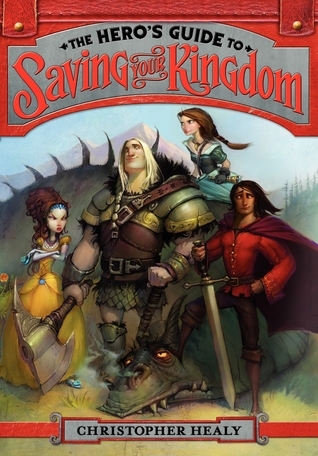 Whatever method you choose, I highly recommend The Hero's Guide to Saving Your Kingdom. I think you expressed what I liked about this book very well - it has layers of humor for the young AND old, and as such is a supremely entertaining book. Thanks for sharing your review! This sounds too cute for words Alison! I can just picture this group of princes bumbling around in the forest and the girls rolling their eyes as they go and try to help them. Win. I think Bronson Pinchot would be an amazing narrator as well, love him! Sounds like a great fun read! Thanks for sharing. I’m in the middle of this one right now and I agree with you that it’s hilarious. I actually really like the illustrations because they help keep everyone separate in my mind. There are a lot of characters running around otherwise and it can be easy for me to lose track of someone. Books that play fast and loose with fantasy clichés are always my favorite. I'm so glad that you loved Hero's Guide. It was one of my favorite reads last year. I loved the how Healy created such distinctive personalities for each character, even the evil witch. I kind of loved her. Duncan totally stole my heart, too. His talent for naming woodland creatures cracked me up. And the whole thing with the dwarfs/Dwarves. I kind of want to listen to the audiobook now, too. Do you think you will read the second book? It's really good, although not as good at this one. Aah I'm so glad you liked it! I'm also totally excited that you listened to it! I'm super disappointed Bronson Pinchot isn't reading the sequel (no one is, as far as I know). I do wish the bumbling/competent lines weren't *quite* so gender-separated, but it's a minor quibble. Do you think you'll read the sequel? Aww, this one really does sound pretty delightful! I love how witty it sounds! It's nice that the author doesn't take himself too seriously. I'll have to look into the audiobook for sure because my favourite audiobooks tend to be the ones in which the narrator has to juggle many voices with good timing and does it perfectly, so this one sounds excellent. I thought this book was pretty neat and I'm glad to have the sequel waiting to be read. I just wish Briar Rose hadn't been a villain as she as always my favorite princess. I'm so glad that you loved Hero's Guide. It was one of my favorite reads last year. Unique design designed for Omega running watches have been brought in quite frequently, additionally they look like they're chanel replica gaining large numbers of perfect over the years. Many of us contain Omega running watches and they'll continue on retailing because they're crafted only using the best possible items additionally, the largest dependability. Too much effort adopts helping to make each individual man or woman sit back and watch and even patek philippe replica sale that is why in the Omega Small business to be honored with the strongest qualification conceivable. Around the Vancouver 2010 Olympic Cold weather Mmorpgs, Omega running watches sustained a powerful Olympic timekeeping legacy of music which is tracked into that California Olympic Mmorpgs on 1932 after the Omega product turned out to be the best small business to remain commissioned considering the timekeeping of every situation. Omega initiated the nation's Olympic timekeeping culture only using stop-watches and even chronographs. And also the nation's leading Olympic task, Omega is become lurking behind nearly all chanel replica 1112 a very important complex changes in all of in sporting timekeeping. With the many decades which will accompanied, Omega pioneered a few key element changes funding sporting timekeeping comprising the photofinish camcorder, that Racend Omega timer, additionally, the to start with electric powered outdoor activity timer, that Omega precious time recorder (OTR).